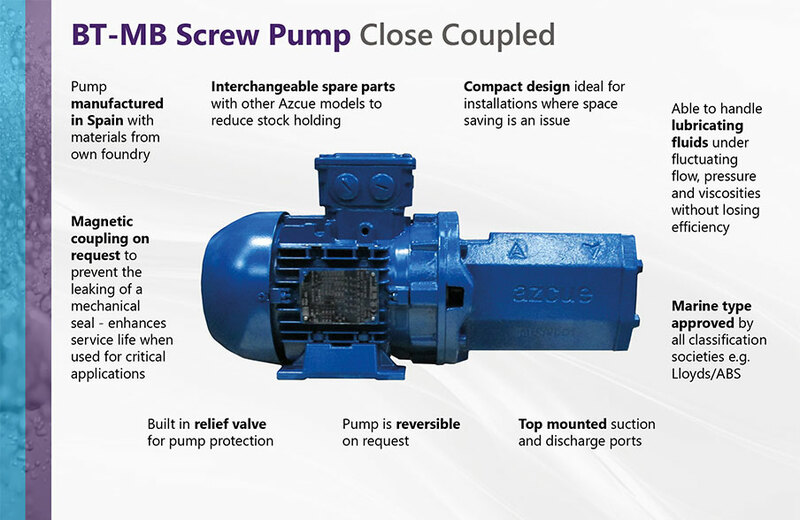 The Azcue BT-MB ATEX Close Coupled Triple Screw Pump is the smallest screw pump in the Azcue range; a competitively priced model in the market for its pressure capabilities. As a positive displacement pump, screw pumps are able to handle lubricating fluids under fluctuating flow rates, pressures and viscosities without losing efficiency. The Azcue BT-MB is ideal for the general transfer of fuels and lubrication oils under moderate performance conditions, the BT-HM is ideal for more demanding and hazardous applications thanks to its ATEX motor. Thanks to its close coupled design, this horizontal self priming screw pump is compact in size for installations with limited space and has a top mounted suction and discharge. These Aczue pumps come complete with an integrated manually adjustable pressure relief valve. The nature of the screw pump design means it can be used where suction capabilities are difficult such as pumping over long distances or where the pump is located above the fluid.